The Suffering Servant described in Isaiah is a remarkable account of the scapegoating mechanism. All religions have stories that describe scapegoating, though the truth of the victim’s innocence is hidden and the violence is attributed to a god. The Suffering Servant is distinctive because it articulates the victim’s perspective. Isaiah introduces the Suffering Servant: “Behold my servant, whom I [God] uphold, my chosen, in whom my soul delights; I have put my Spirit upon him, and he will bring forth justice to the nations.” (42:1) The Servant will bring forth justice, but not in the traditional sense. All primal religions had regarded justice in terms of divinely sanctioned retributive violence. The justice brought by the Suffering Servant will involve revealing to “the nations” the scandal of sacred violence. Isaiah later relates, “I will give you [the servant] as a light to the nations, that my salvation may reach to the end of the earth.” (49:6) We will see that the notion of “salvation” here is very different from traditional understandings. 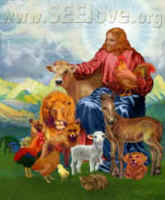 Isaiah reinforces this message: “All we like sheep have gone astray; we have turned every one to his own way; and the Lord has laid on him the iniquity of us all.” (Isa 53:6) Then, Isaiah reminds readers that the Servant was innocent: “although he had done no violence, and there was no deceit in his mouth.” (Isa 53:9) It cannot be clearer that the Suffering Servant is a victim, not deserving of the violence he receives. Paradoxically, after acknowledging the Suffering Servant’s innocence, Isaiah still maintains that his suffering was God’s will: “Yet it was the will of the Lord to bruise him; he has put him to grief; when he makes himself an offering for sin. (Isa 53:10) Then, the text reads, “…through him the will of the Lord shall prosper…The righteous one, my servant, shall make many righteous, and he shall bear their iniquities.” (Isa 53:10-11) Commentators observe, I think correctly, that this passage predicts that people will learn from the self-sacrifice of the Suffering Servant, and this will lead to righteousness. Many commentators, however, fail to take the next step, which is to see the Suffering Servant as part of God’s plan to reveal the scandal of sacred violence. If the Servant were guilty in any way, his death would be defensible as divine justice, but his stark innocence shows that he is a victim of the scapegoating mechanism. In the New Testament, we will find an even clearer example of the innocent Suffering Servant, who will expose the scapegoating mechanism, which has been “hidden since the foundation of the world.” (Mt 13:35) His story will demonstrate that God wants mercy and not sacrifice. (Matthew 12:7) First, we will look at the later prophets, who assert that God does not want sacred violence.